If you enjoyed Susan’s original book, How to Grow a Backbone: 10 Strategies for Gaining Power and Influence at Work, you’ll enjoy her newest work, Life Be In It. Feel like you've lost your groove? 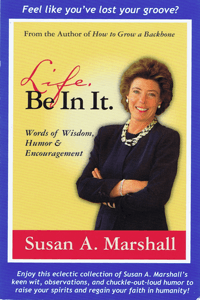 Flip through this eclectic collection of Susan A. Marshall's keen wit, observations, and chuckle-out-loud humor to take your spirits and regain your faith in humanity. Looking for more inspiration? Check out our podcasts!